A nondisclosure agreement protects against the divulgence of sensitive and valuable confidential information.This type of agreement is very important in trade secret or patent cases. It is imperative that this type of written agreement be very specific as to what information is considered confidential and private. Contact our Zeller attorneys to draft a nondisclosure agreement to protect valuable private information. Identifying and protecting confidential information is critical in establishing a successful business. A nondisclosure agreement is limited to the protection of a business’s information and trade secrets. Often times the signing of a nondisclosure agreement is a condition of employment. These agreements usually state that the employee agrees to hold in strict confidence the employer’s confidential data and other information concerning products, services, operations, suppliers, and customers. The employee agrees to be responsible for the safeguarding and security of the information that he or she is privy to or has access to during his or her employment. Identifying and protecting confidential information is critical in establishing a successful business. As such, nondisclosure agreements are essential in running a business. Contact our Zeller attorneys to draft a nondisclosure agreement to protect your valuable private information. 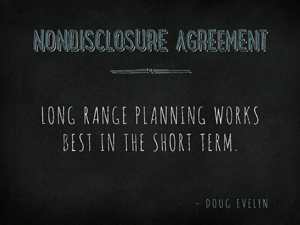 A nondisclosure agreement usually defines and identifies the confidential information in question. Trade secrets, processes, codes, procedures, developments, designs, improvements, strategies, prices, costs, marketing plans, customer and supplier lists and files, and similar information of a proprietary nature, are examples of confidential information often protected by nondisclosure agreements.